Acute respiratory distress syndrome (ARDS) is associated with a high mortality rate of 35% in intensive care units and 40% in hospitals . Histological studies show that an early inflammatory phase is followed by a fibroproliferative repair phase, leading to either the resolution of ARDS or irreversible lung fibrosis . It has been shown that this ARDS-associated lung fibrosis is linked to a poor outcome [3–5], an increase in the duration of mechanical ventilation  and an alteration in the quality of life . Modulating excessive lung fibroproliferation could improve the ARDS prognosis. Corticosteroid treatments have been shown to be effective in improving the number of days alive without mechanical ventilation [8, 9], although the effect on mortality is still controversial [10–13]. All these points plead for the use of diagnostic tools for the early diagnosis of lung fibroproliferation during ARDS. The gold standard for diagnosing ARDS-associated lung fibrosis remains an open lung biopsy (OLB) and histological examination, which is invasive and cannot be repeated easily . Clinical parameters (oxygenation; compliance of respiratory system) remain insufficient and unspecific for the diagnosis. 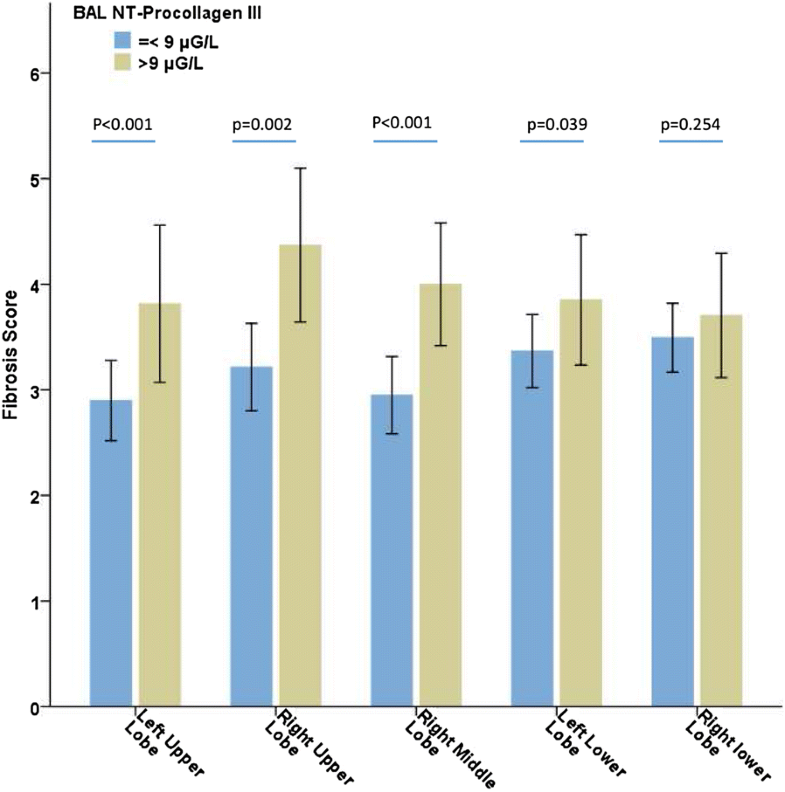 The N-terminal peptide of alveolar procollagen III (NT-PCP-III) is validated as an alternative diagnostic test . A precursor of collagen III, NT-PCP-III represents the pulmonary turnover of collagen [16–18]. It has been shown that alveolar NT-PCP-III exceeding 9 µG/L on bronchoalveolar lavage (BAL) is associated with histological lung fibroproliferation . 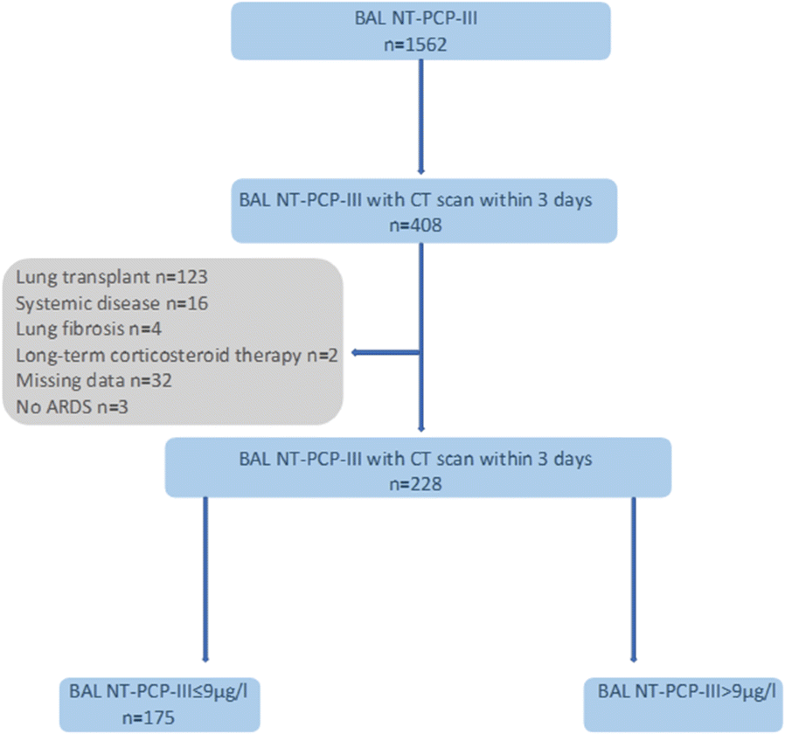 The second hypothesis to explain the low correlation between fibrosis scores and NT-PCP-III levels may be related to the chronological change in the lung fibroproliferation process. 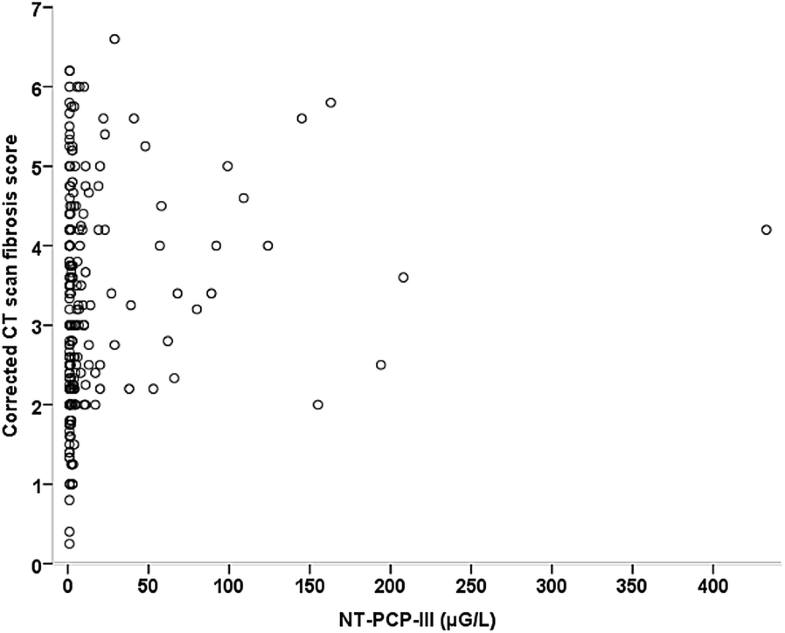 Alveolar NT-PCP-III is an early marker of lung fibroproliferation. As a collagen III precursor, alveolar NT-PCP-III precedes the deposition of type 1 collagen associated with histological lung fibrosis [26–28]. CT scans describe lung fibrosis signs that correspond to alterations in the pulmonary structure. We showed that when CT scan fibrosis scores are high, plateau pressures and respiratory system compliance tend to be higher and lower, respectively (Table 3). These results agree with the study by Burnham et al. , which showed that plateau pressures and static respiratory system compliance were correlated with the presence of crosslinking, ground glass and bronchiectasis on CT scans on the 14th day of ARDS. This difference in the age assessment of the lung fibroproliferative process could explain the weak correlation found in our study. Indeed, in the present study, alveolar levels of NT-PCP-III were measured relatively early in the ARDS history (5 [0–14] days). However, Forel et al. showed that high alveolar levels of NT-PCP-III on the 6th day (median) of ARDS onset are associated with histological lung fibroproliferation on lung biopsy performed on the 10th day (median). The different stage in the fibroproliferative process could explain why we did not find a significant difference in ventilatory parameters based on alveolar NT-PCP-III, including respiratory system compliance. In fact, it is the deposition of collagen I within the lung tissue that causes a decrease in elasticity and a reduction in lung compliance. Demoule et al. showed an inversely proportional logarithmic relationship between respiratory system compliance and alveolar NT-PCP-III. We not observed a similar relationship. This difference could be explained by the use of different assay techniques to determine NT-PCP-III in Demoule and our study. The reduction in respiratory system compliance remains a complex matter of interpretation. Pulmonary volume reduction during ARDS appeared to be the main mechanism for this reduction [29, 30], but lung damage and thoracic wall involvement also played a role, which was not analysed in our study. Moreover, in the present study, we registered respiratory system compliance on the day of BAL and CT scan, but we not analysed its changes during time which are relevant in the clinical practice. 13613_2019_516_MOESM1_ESM.docx Additional file 1. CT scan scoring system for lung fibrosis. 13613_2019_516_MOESM2_ESM.docx Additional file 2. Comparison of ventilatory parameters and organ dysfunction score on CT scan and BAL days. 13613_2019_516_MOESM3_ESM.docx Additional file 3. Relationship between crude CT scan fibrosis score and alveolar levels of NT-PCP-III.